The chic Santa Barbara stay-over has partnered with Carhartt Vineyard and Winery. Is that the hotel on the label of that syrah? Why yes it is: Canary Hotel in Santa Barbara has formed a flavorful partnership with Carhartt Winery. NICE WINES AND SWANKY HOTELS... are not an uncommon pairing. You might enjoy a gratis glass of chardonnay during the late-afternoon wine and social hour, or find a complimentary bottle in your room, or learn that the chef in the hotel restaurant spent a month training at a local winery's kitchen. The two worlds, in short, are not distinct or all that far in part in theme; they both aim to please discerning travelers or regulars or those looking for a new adventure. But what's still rather new in this area, or at least not seen all that often, is when a hotel gets its own branded label via a partnership with a regional winery. That's just the fancy 'n flavorful thing happening at Kimpton's Canary Hotel in Santa Barbara, a city which, you may not be surprised to learn, is within a short drive of some of the vine-iest, fine-time-iest wine country in all of the Golden State. 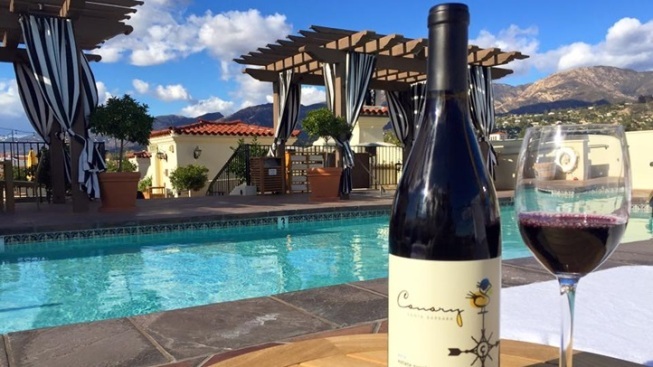 Carhartt Vineyard and Winery, located in Santa Ynez Wine Country, has teamed up with Canary Santa Barbara on a 2013 Estate Syrah, one that boasts the name of the hotel, in addition to the name of the winery, on the label. BUT THE PARTNERSHIP CONTINUES... beyond the tasty libation found under the cork. The syrah is part of the Syrah and Suites package, which is on at the hotel from February through May 2016 (as in, book your stay during that time period). It goes further, though, than finding a bottle of the good stuff in your suite. You'll get a wine tasting at Carhartt Vineyard, for you and the BFF you're traveling with, so count on soaking up some rustic-y atmosphere in addition to the chic scene in the American Riviera. How often does a guest who receives a comp bottle of hotel wine A) see the hotel's name on it and B) get to go to the source during their stay, the better to view the whole picture? It's a novel experience for the oenophile. Lending more atmosphere to the proceedings is the Mediterranean-style suite at Canary, so make time to kick back in your room, too. "Wine is an important part of Santa Barbara's culture," says Ryan Parker, the hotel's GM. "Many of our guests travel here specifically for the wineries, so we are always looking for authentic ways to capture the local flavors and create the quintessential Santa Barbara experience." CANARY SANTA BARBARA, by the by, is Carhartt's first hotel partnership. Canary is also the first Golden State Kimpton to try this out, so don't be surprised to see more toast-worthy partnerships coming down the hotel-winery pike.